Nestled in the hills of the beautiful Blue Ridge Mountains is where you'll find Honeybear Lodge! This luxurious, well appointed cabin offers the best in furnishings, amenities and comfort. Attention to detail is an understatement when it comes to this home and you'll enjoy all the amenities and conveniences you come to expect when staying at a property of this caliber. With all paved access and only 2.3 miles from downtown Blue Ridge and 2 minutes from the Toccoa River, Honeybear Lodge is the perfect cabin to plan your next getaway! 3 bedrooms and 3 full baths, each on it's own floor, ensures privacy is never an issue. The great room hosts a stunning rock gas fireplace, a 42" flat screen TV, leather furniture and plenty of windows and glass doors to admire the wooded yard and mountain views. A well stocked, organized kitchen will put a smile on any Chef's face and this one is no exception. With a beautiful dining area there is no excuse to not share a meal with friends, family or someone special. The King Master has a 37" TV, private bath with jetted tub and walk-in shower, a private covered balcony (the perfect spot to enjoy a good book or that 1st cup of morning coffee) making this a haven you may never want to leave! The Queen bedroom on the main level caters to relaxation and access to the large covered porch with seating just adds to the perfection of this cabin. If you're drawing straws for the bedrooms, no worries, you really can't lose. The Queen bedroom on the terrace level lacks for nothing and provides the same level of comfort the other bedrooms offer. Who doesn't enjoy a campfire in the mountains on a clear, starry night? Bring a pack of hot dogs or grab a bag of marshmallows and see if you don't feel like a kid again! Throw in your favorite beverage and let the experience begin! If you''re looking for a little excitement, you're in luck! The pool table on the terrace level has thrilled many a guest whether playing competitively or just for fun. There's another seating area with TV on this level and the large hot tub right outside the door is the perfect antidote to ensure the perfect end to a perfect day. For our golfing enthusiasts, you are only a few minutes from the beautiful "Old Toccoa Farm" Golf Course. Honeybear Lodge is conveniently located 5 minutes from downtown Blue Ridge where fabulous dining and unique shopping await you! 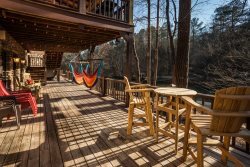 As a guest at Honeybear you also have access to the Toccoa River which is located just a short distance from the cabin. There is a covered pavilion for picnicking, plenty of ground area for the kiddo's to romp and play, throw a football and of course, access to the very popular Toccoa River whether it be for cooling off on a hot summer day or trying your luck on catching one of the trophy trout that call this river home. One thing for sure.....Honeybear Lodge is a place you'll be glad you found and look forward to coming back! Fully equipped kitchen: Refrigerator, stove, oven, microwave, dishwasher, toaster, coffee maker, dishes, glassware, utensils, cutlery, pots, and pans. Linens for each bed, 2-bath towels, 1-hand towel, 1-washcloth per person listed on guest list, dresser or closet for clothing storage, central heat & air, washer/dryer, vacuum and/or broom and dust pan, mop, cable or satellite TV, internet, telephone for local calls and propane gas grill. In addition we provide a complimentary start-up supplies of: Toilet Tissue (2 rolls per bathroom), 1- roll paper towels, 4- kitchen garbage bags, 1- hand soap for each bath and kitchen, dishwasher detergent, dishwashing liquid and laundry detergent for at least 2 loads. Many of our cabins include more that this basic list of inventory items. 12% lodging tax will be added to all reservations. Great getaway with family! The cabin was easy to find and close to town. The cabin was clean and the furnishings were nice. We enjoyed playing pool downstairs and at night enjoyed a fire in the fire pit. Easy to book. The cabin was very nice, updated, clean and well furnished. This is the second time booking through Mountain Oasis. The two cabins we have stayed in show that this company must have high expectations for a cabin to be placed on their rental list. We had a wonderful time here . The hot tub was great , played pool , cooked some great meals and enjoyed the view while relaxing on the deck . I have no problem with home away or VRBO but something needs to be done, I dont need a middle man. Book directly with the property manager and you will save $! Everything was perfect at the cabin! Again, overall it was a great experience. However, a simple thing like wood for the pit made it to where we were not completely satisfied. In our discussions with friends who asked about the trip we always seem to come back to the fact that there was not wood for the fire pit outside. A very minor detail that could be easily fixed. This was my families first vacation, my husband, myself and three young children and we couldn't have asked for anything more! Blue ridge is beautiful and so was the property! Thank you for Everything! Great location. Very close to downtown. It's a great getaway for those looking to relax. I would recommend driving to the river over walking. I also found several hiking spots not too far away. Overall I had a great time, and I enjoyed staying here. We enjoyed our long weekend, location is perfect. Easy access to town, which we ventured only 1 day. We just enjoyed the cabin and views so much we preferred staying in! I recommend the gift baskets! Thank you so much for the attention to detail, I called to let the staff know that the other couple staying with us, she had siliac disease and had food restrictions. I asked to remove things which they said no problem. But... not only did they remove they added several items to accommodate my friends diet needs... Baskets were perfect! Thank you thank you! I hoping to plan another trip for thanksgiving! Great property! Great property-- we enjoyed the hot tub and the pool table. Enough bedrooms and bathrooms for everyone. Easy to find and wonderful views. We would stay again. Other than the upstairs toilet not working right (which we let them know) everything was awesome. Very clean. Booking was easy and straight forward. The cabin was nice and peaceful, by far the set of pots and pans I've seen in a rental... The roads to the fishing spot was a little bumpy and would be hard for some cars to manage, thanks and would recommend it to others.